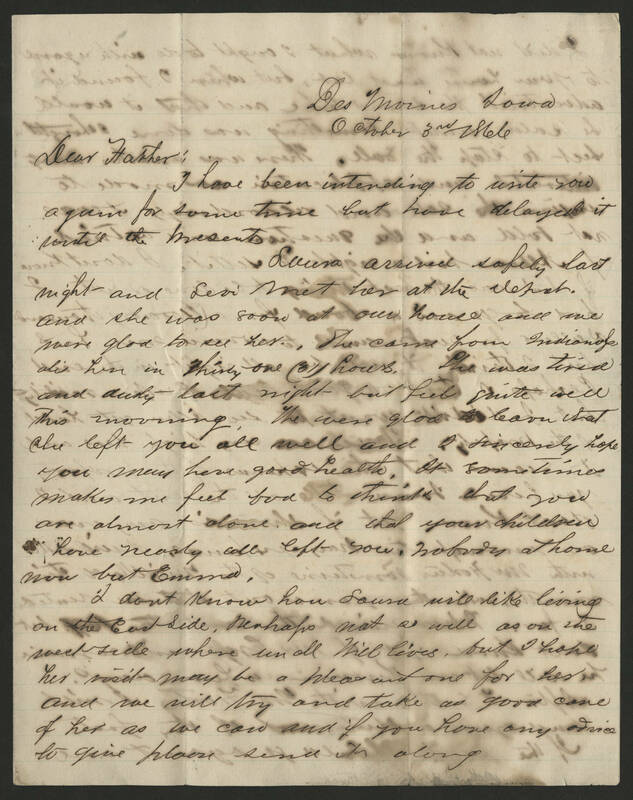 Des Moines Iowa October 3rd 1866 Dear Father: I have been intending to write you again for some time but have delayed it until the present. Laura arrived safely last night and Levi met her at the depot, and she was soon at our house and we were glad to see her. She came from Indianapolis here in thirty one (31) hours. She was tired and dusty last night but feels quite well this morning. We were glad to learn that she left you all well and I sincerely hope you may have good health. It sometimes makes me feel bad to think that you are almost alone, and that your children have nearly all left you, nobody at home now but Emma. I don't know how Laura will like living on the East Side. Perhaps not so well as on the west side where uncle Will lives, but I hope her visit may be a pleasant one for her, and we will try and take as good care of her as we can and if you have any advice to give please send it along.